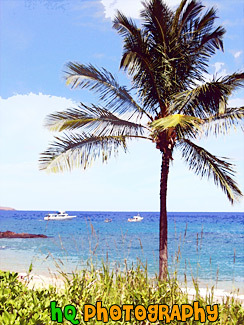 A scenic photo taken of a palm tree, boat, and the Pacific Ocean off the coast of Makena, Hawaii, which is on the island of Maui. 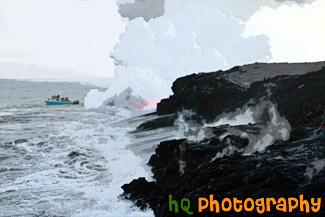 A scenic picture taken a lava flowing into the Pacific Ocean from Kilauea volcano located on the big Island of Hawaii. 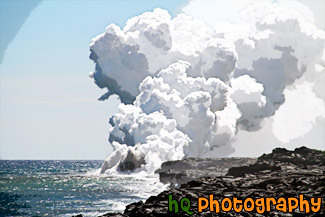 The hot lava makes the huge steam cloud seen flowing out of the ocean. 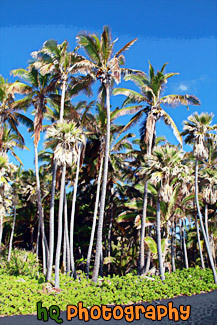 Beautiful scene of palm trees, the beach, and ocean on the island of Maui, Hawai'i. 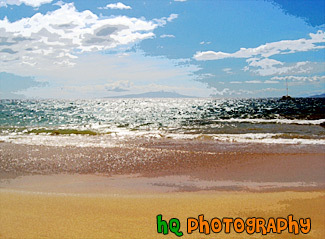 This specific beach is located in Makena. 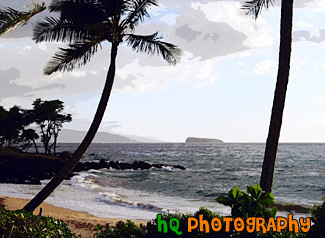 Makena is one of South Maui's prime resorts. 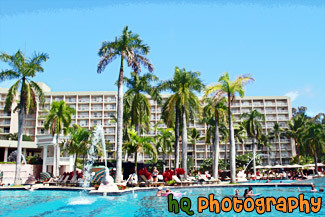 Maui is the second largest of the Hawaiian Islands with a land area of 729 square miles. It is 48 miles long and 26 miles across at its widest point. 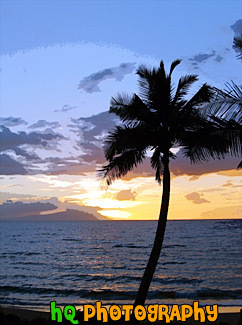 Maui has 81 accessible beaches. 39 have public facilities. Sands may be white, gold, black, salt and pepper, green or garnet, due to ancient volcanic activity. 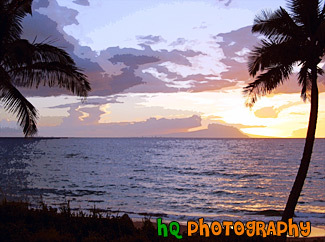 A beautiful sunset located on the island of Maui, Hawaii off the resort of Makena. This sunset is taking place over the Pacific Ocean and you can see the reflection of the sunset in the ocean. 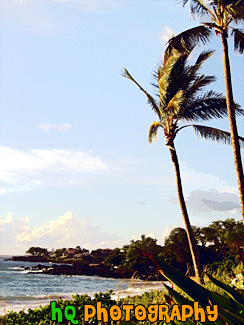 A palm tree being blown in the wind on the beach of Makena located in Maui, Hawaii. 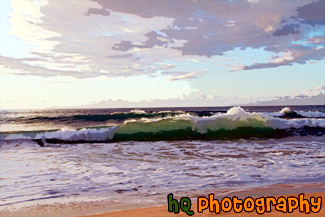 The mornings in Maui are pretty calm, but as the day goes on the wind picks up and the waves also get bigger and bigger! 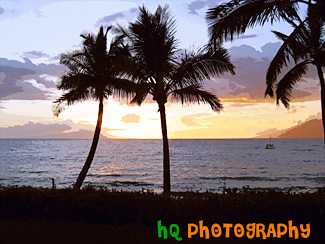 A beautiful picture of a sunset taking place on the island of Maui located in Hawaii. In this photo you can see the silhouette of the palm treen in the foreground and the beautiful colors of the sunset in the distance also reflecting in the Pacific Ocean and the waves. 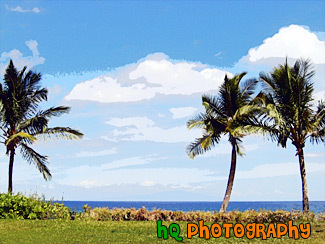 A picture of three palm trees looking off the coast of Makena, Hawaii which is located on the island of Maui. 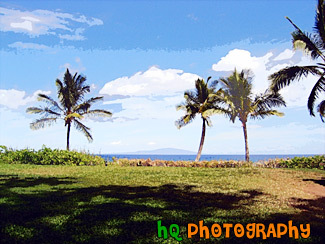 This photo was taken on a beautiful sunny and hot day in Maui. A scenic picture taken of big waves and a sailboat in the distance off the coast of Kauai, Hawaii. 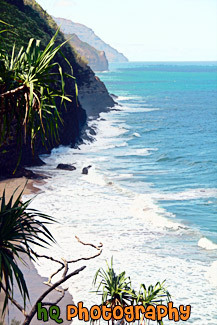 This photo was taken from the Na Pali Coast at Hanakapi'ai Beach looking out at the Pacific Ocean. You have to hike the Kalalau Trail to reach this beach. 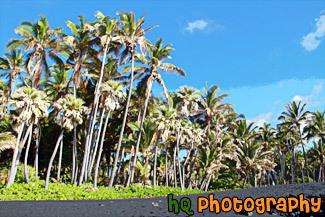 A scenic picture taken of the black sand and palm trees located on the Big Island of Hawaii. Beautiful blue sky is seen in the background. This black sand beach is located at Punaluu Black Sand Beach. 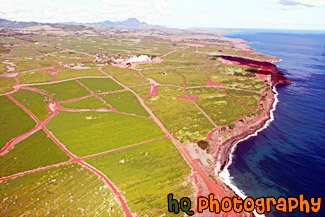 The sand is black because of the constant volcanic activity on the island. 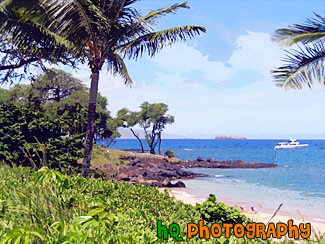 A scenic photo of the beach and a boat taken on the shore of Makena Beach located in Maui, Hawaii. 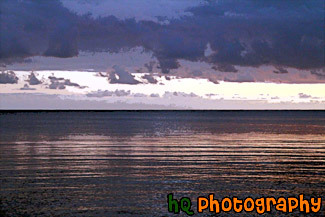 A scenic picture taken of the Pacific Ocean and clouds at dusk as the pink sky starts to set in. 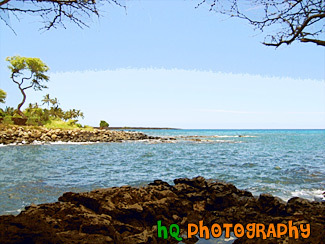 This photo was taken on the island of Kauai, Hawaii. 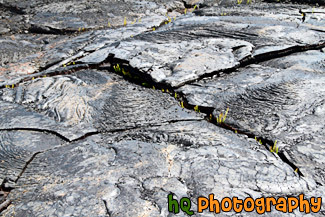 A scenic vertical picture taken close up of a cracked lava field located on the Big Island of Hawaii at Hawaii Volcanoes National Park, Hawaii. 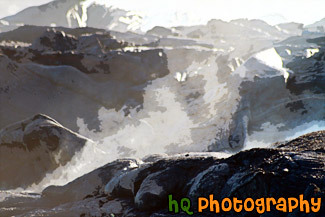 A scenic picture taken of awesome crashing waves seen along a beach in Kauai, Hawaii. 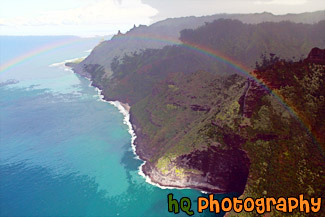 This photo was taken off the Na Pali coast from Hanakapi'ai Beach. A scenic picture taken of the sun about to set over the pacific ocean on the island of Kauai, Hawaii. 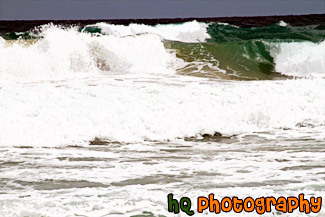 This photo was taken at Polihale State Park. 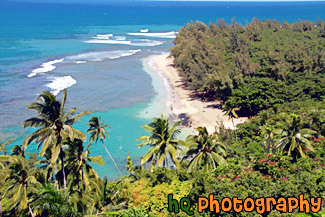 A scenic picture looking down at Ha'ena Beach Park located on the island of Kauai, Hawaii. 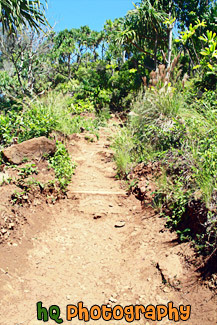 This photo was taken from the Kalalua Trail. 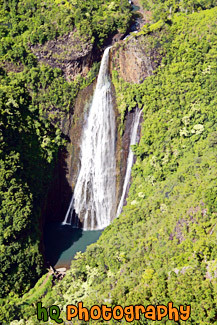 A scenic vertical picture taken of the waterfall seen in the movie Jurassic Park located on the island of Kauai, Hawaii. This photo was taken from the air in a helicopter. 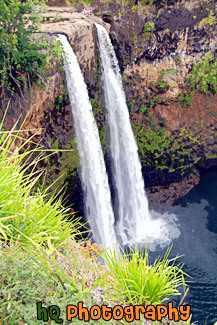 The actual name of this waterfall is Manawaiopuna Falls, but it is more commonly known as Jurassic Falls because of the movie. 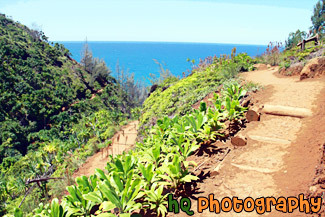 A scenic picture taken of part of the Kalalau Trail located on the island of Kauai, Hawaii along the rugged Na Pali Coast. 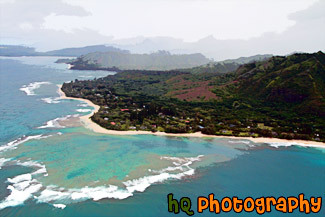 A scenic picture taken of the island of Kauai, Hawaii from the air in a helicopter. 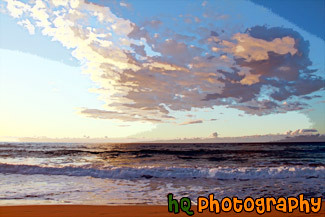 A scenic picture taken of Kauai and the Pacific Ocean and clouds at dusk as the pink sky starts to set in. 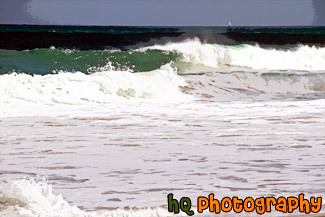 This photo was taken at Polihale State Park. 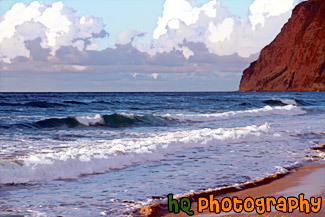 A scenic picture taken of the beach shore at Polihale Park located on the island of Kauai, Hawaii. 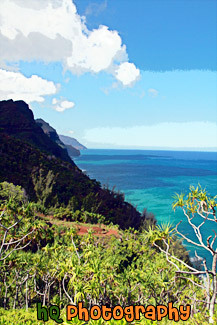 Puffy clouds and part of the Na Pali coast are seen in this photo. Beautiful waves from the Pacific Ocean are also seen as the sun is getting ready to set. 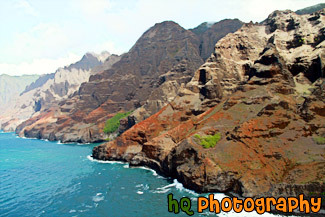 A scenic picture taken of the Kauai Coast from a helicopter. Clouds are covering the island in this photo. A scenic picture of some big crashing waves taken off the coast of Kauai, Hawaii along the Na Pali Coast. 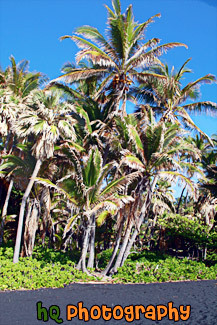 This photo was taken from the Hanakapi'ai Beach. 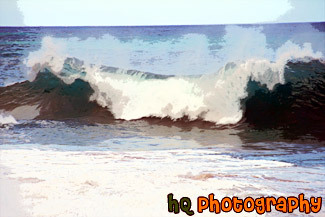 A scenic picture taken close up of some big waves at Kealia Beach located in Kauai, Hawaii. Surfers and boogie boarders flock to this water for the regular surf and wild conditions due to the constantly changing sand bar. The half mile long beach is a favorite for jogging, dog walking, kite flying, and bon fires. 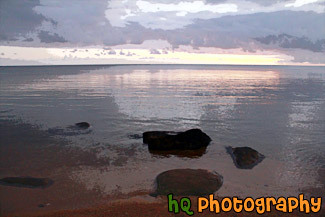 A scenic beautiful picture taken of a Kauai, Hawaii sunrise with pink and purple skies reflected onto the Pacific Ocean. This photo was taken at Secret Beach near Princeville. 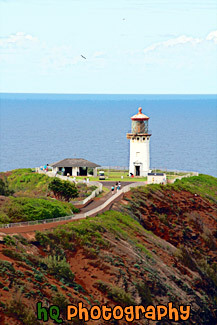 A scenic vertical picture taken of the Kilauea Lighthouse which is located at the northernmost point of the main Hawaiian Islands at Kauai. It was built in 1913. 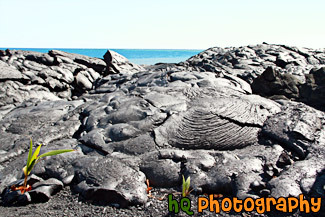 A scenic close up picture taken of a lava field located at Hawaii Volcanoes National Park, Hawaii, which is on the Big Island. 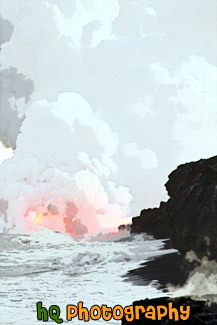 Red lava flowing into the Pacific Ocean from the Big Island of Hawaii. 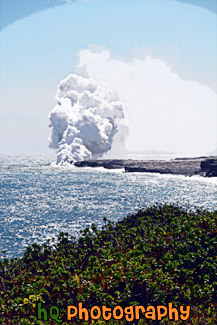 When the lava flows into the ocean, it creates big steam as shown in this picture. A scenic picture taken of lava flowing into the Pacific Ocean off of the coast of the Big Island, Hawaii. Lava flowing into the Pacific Ocean off the coast of the Big Island, Hawaii. 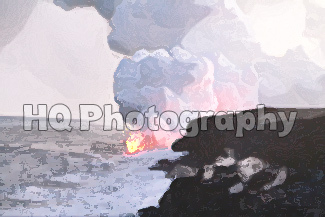 A scenic picture taken of lava entering the Pacific Ocean off the coast of the Big Island in Hawaii. 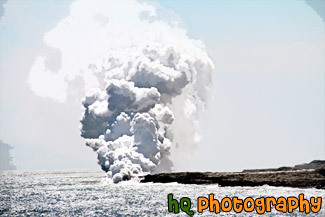 You can see the steam created from the hot lava entering the ocean. The lava is coming from the Kilauea volcano. 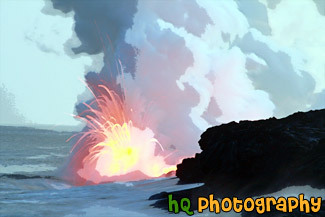 A scenic vertical picture taken of hot lava entering the Pacific Ocean located on the coast on the Big Island of Hawaii. 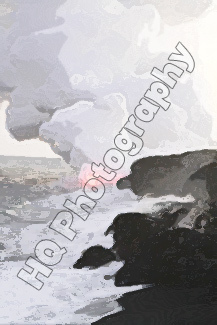 A scenic vertical picture taken of lava entering the Pacific Ocean off the rocky coast of the Big Island, Hawaii. A beautiful golf course located on the resort of Makena on the island of Maui, Hawaii. 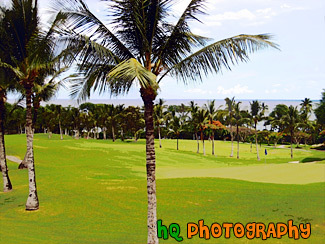 On the golf course you can see all the pretty palm trees covering the beautiful golf course next to the Pacific Ocean. 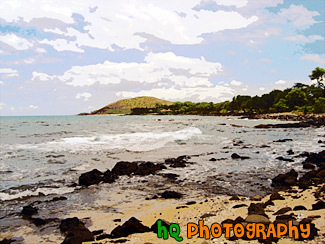 A veiw of the hills, ocean, clouds, and beach landscape of Maui, Hawaii. A scenic aerial picture taken of the Na Pali Coast located on the island of Kauai, Hawaii. This photo was taken from a helicopter as this fifteen-mile stretch of rugged coastline on the northwest shore of Kauai is mostly inaccessible due to its characteristic sheer cliffs that drop straight down, thousands of feet into the ocean. 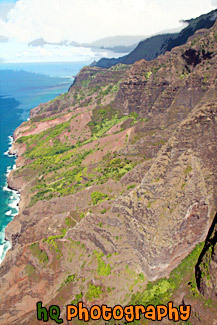 A scenic vertical picture taken of the Na Pali coastline seen from hiking the Kalalau Trail in Kauai, Hawaii. Clouds and blue sky are seen above. 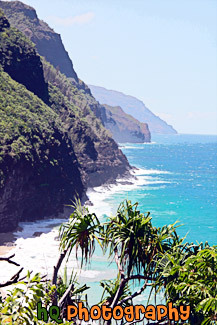 A scenic vertical picture taken of the Na Pali Coast while hiking on the 11 mile long Kalalau Trail in Kauai, Hawaii. A scenic picture taken of the Na Pali coastline located in Kauai, Hawaii from the ground. Blue waters and amazing cliffs are seen here. 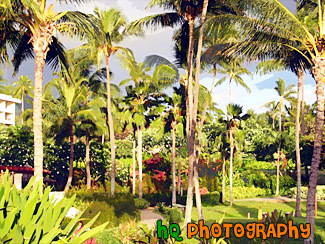 A view of the many palm trees located at the Maui Prince Hotel on the Makena Resort in Hawaii. 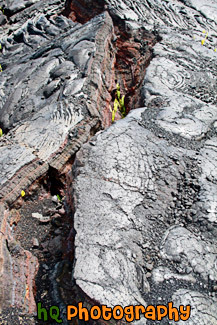 Close up picture of red lava flowing into the Pacific Ocean located on the Big Island of Hawaii. 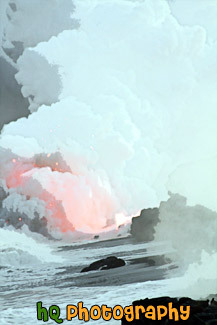 Scenic picture taken of lava going into the Pacific Ocean. 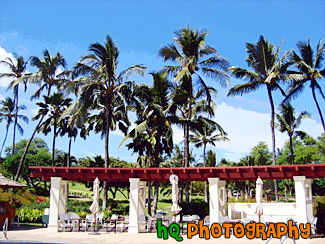 A scenic photo of the Makena Resort Pool on the island of Maui, Hawaii. This resort is located right on the coast of the Pacific Ocean in Maui. 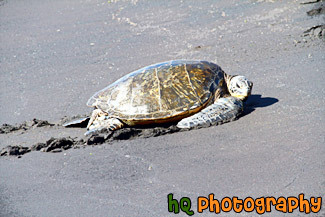 A scenic picture of a sea turtle located on a black beach at Punaluu Black Sand Beach on the Big Island of Hawaii. 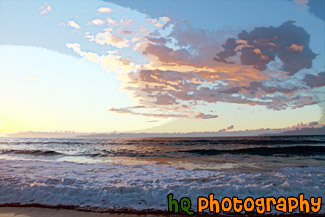 A scenic picture taken of the sun rising at Secret Beach in Kauai, Hawaii near Princeville. In this photo you can see the pink and purple skies of the sunrise reflecting onto the Pacific Ocean. Rocks are also visible in the foreground. A tourist boat is watching the steaming lava enter the Pacific Ocean off of the coast of Hawaii. 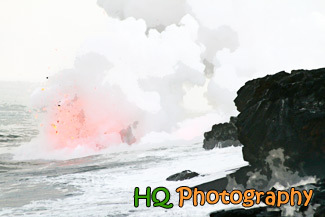 This photo was taken on the Big Island of Hawaii as the Kilauea Volcano had lava flowing. 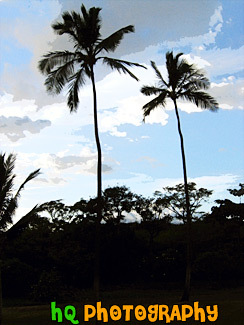 A scenic silhouette of two palm trees located in Maui, Hawaii with a beautiful sky behind them as the sun is getting ready to set on this beautiful island. 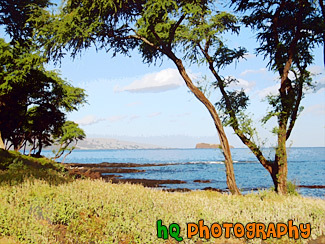 A scenic picture taken of Maui and the Pacific Ocean off the coast of Makena, Hawaii, which is on the island of Maui.